This Friday is “Friday the 13th”! The pre-dance lesson will be Jitterbug. It’s a great dance to learn. It’s actually the first partner dance I learned along with Foxtrot way back in the day. Join me at 7pm for the lesson and then stay for the dance from 8-11pm. I added some new Line Dance Videos onto Youtube this week. Take a look and be sure to subscribe to our free Youtube channel and you’ll be the first to see the new videos. Here is a great link to help you subscribe with just a click. 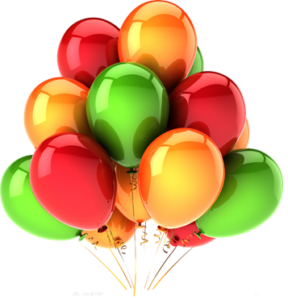 Please scroll down and SUBMIT A COMMENT about this post for Dance Events 2018-7-13 at the bottom of the page. We’re ready to take registrations for the next Summer Dance Classes. You click here to enroll and get a discount for registering early! 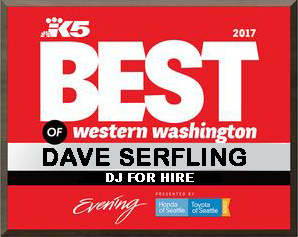 Join Dave Serfling for a morning of Line Dancing. Dave will walk through each beginner Line Dance and play a couple songs to dance it to. Bring your family and friends to this fun outdoor Line Dancing event. It’s free. Maple Valley Farmers’ Market is pet-friendly! Your furry friends are welcome at the Market provided they are on a short, non-extendable leash. Get ready to hoe down ‘til sundown! 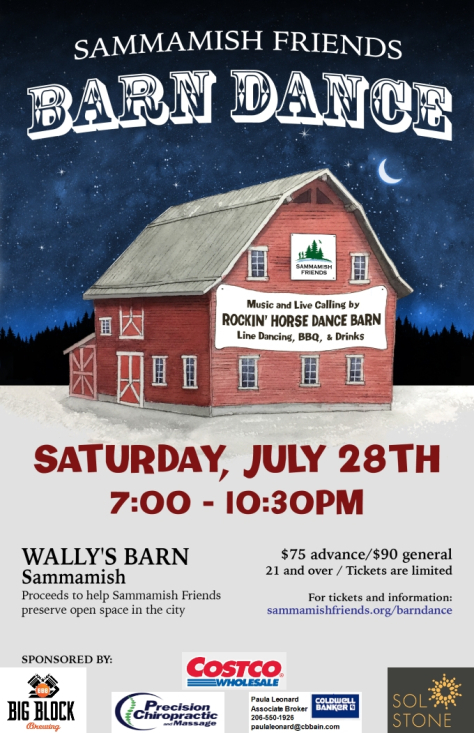 Sammamish Friends presents a good old fashioned barn dance. Join us on Saturday, July 28th from 7:00 to 10:30pm. Located at Wally Pereya’s newly-renovated historic barn on the parkway in Sammamish. Earlybird tickets are $75 per person. Tickets purchased after June 21st will be $90. Appetizers and drinks will be provided. There will be no ticket sales at the door. Proceeds will go toward preserving green space in Sammamish. 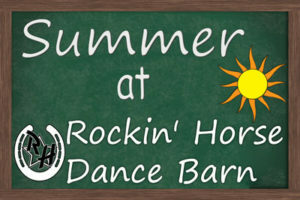 Entertainment and line dance calling brought to you by Rockin’ Horse Dance Barn. Space is limited, so get your tickets today! During your purchase, consider making an additional donation to support open space preservation in Sammamish. Here are two Beginner Line Dances we do sometimes on Friday Night. 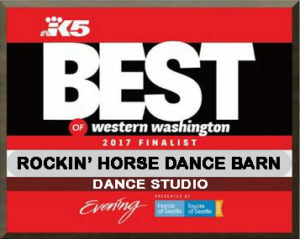 You can watch the videos a few times and try to learn them or join our Line Dance classes to learn them. Then you can use these videos and many more to practice or review the ones you’ve learned.